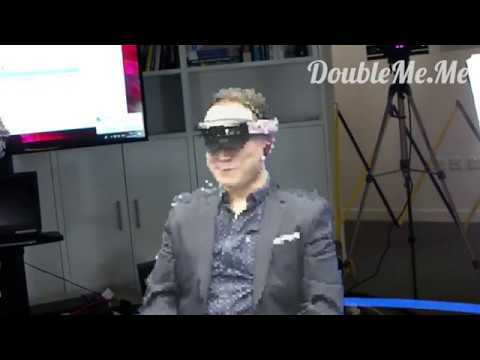 Holographic Mixed Reality startup, DoubleMe and University of Surrey, 5G Innovation Centre (5GIC) team up to bring widely accessible personal holoportation platform, to the 5G network by the end of 2019. SUNNYVALE, CA, June 12, 2018 /24-7PressRelease/ -- DoubleMe, Inc, a Holographic Mixed Reality Capture technology and platform startup, announced today that it has been awarded $3M research and development (R&D) grant by Institute for Information & Communications technology Promotion (IITA), an R&D strategy and planning agency under the Ministry of Science, ICT, and Future Planning in South Korea. The grant allows DoubleMe to develop and deploy a personal "5G-enabled Real-time Multi-user Holoportation System" by the end of 2019. The word, "Holoportation" was coined in October 2016 in a seminal paper by Microsoft Research, "Holoportation: Virtual 3D Teleportation in Real-time." The paper described a revolutionary method of generating high-quality digital 3D Models of dynamic subjects (i.e., human or animal) and sharing the 3D holographic models on mixed reality devices such as HoloLens in real-time. That made the Sci-Fi magic of the Star Wars "Jedi Conference" a potential reality now. However, to process computationally large data, existing "holoportation" systems require complicated and expensive hardware setups. Inspired by the Microsoft research, DoubleMe started to explore the ways to make holoportation exceptionally affordable and accessible, and recently finalized a new innovative algorithm that only requires one depth sensor such as Kinect and one PC system to process high-quality holoportation in real-time, hence "personal holoportation." To win the grant, DoubleMe teamed up with the University of Surrey, 5GIC (Guildford, UK) to optimize the system and platform for the upcoming 5G network rollout. The grant will help DoubleMe prepare the commercial deployment of holoportation apps for PC and Mac, 3rd party developer SDK, WebGL player, and 5G-optimized service platform. DoubleMe already engaged with major Telcos and telecommunication equipment manufacturers on commercial deployment of the "5G-enabled personal holoportation" platform globally. The Personal Holoportation can be used in the variety of immersive holographic mixed reality applications: teleconference, education, healthcare, collaboration, corporate training, marketing, social media, content generation and sharing, tourism, art, music, etc. The technology will be worth $25B by addressing multiple related markets such as $5.5B Digital holography market, $3B Telepresence market, $215B VR/AR/MR market, and $247B 5G service market. Albert Kim, CEO and founder of DoubleMe, said, "DoubleMe is always about making this new digital medium, digital holography, widely accessible for everyone." "We've been demonstrating a large number of applications by working with students and staff at Ravensbourne University London for two years. This innovation will accelerate the technology adoption. In the end, it will be the real-life Jedi Holographic Conference for everyone." The 5G Innovation Centre is the world's first and largest dedicated center to research into all aspects of 5G system. 5GIC brings together leading academics and key industry partners in a shared vision to help define and develop the 5G system that will underpin the way we communicate, work and live our everyday lives in the future. The 5GIC will drive the delivery of 5G connectivity fabric capable of meeting the needs of tomorrow's connected society and digital economy. DoubleMe and 5GIC had a holographic mixed reality signing ceremony on the R&D collaboration via existing version of real-time HoloPortation that requires four(4) kinects and five(5) PC, last week (https://youtu.be/gP0KxarCQCI) This research endeavor will result in one camera and one pc with high-quality holoportation.